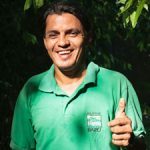 Originally from the Santo Cristo area near the Nauyaca waterfalls in Platanillo, Ronald was born and raised in the South Pacific region of Costa Rica. His grandfather first arrived in the Dominical area by boat from Nicoya. Ronald’s parents made their living from the land in Santo Cristo. The third of seven brothers and sisters, Ronald visited Hacienda Barú for the first time in the early eighties when he and Natalie Ewing became friends at the local agriculture high school. Ronald guides all tours related to the canopy at Hacienda Barú. We think this is ideal for him because of his passion for orchids, and many of these fascinating plants are found in the rainforest canopy. When Ronald was a little boy he did not particularly enjoy soccer or other games, but one day his teacher asked him if he could climb a tree to remove an orchid and bring it to him. This was Ronald’s first contact with orchids. He collected three specimens that day, and his teacher gave him one of them. That was the beginning of years of following in the footsteps of his teacher and others in the world of orchids. That day a passion was born in Ronald for all types of epiphytes. 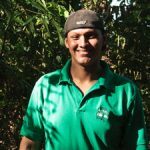 He is the person responsible for more than 60 species of orchids at Hacienda Barú and he delights in showing them in their natural state to his tour guests. Additionally he really enjoys the fauna of the rainforest. His favorite bird is the Red-Capped Manakin, and his favorite mammal is the sloth, but Ronald confesses that his real passion is for botany.